Over 90% of Americans suffer from everyday digestion problems such as gas, bloating, stomach pain, constipation, heartburn, and fatigue after eating. Maharishi Ayurveda provides simple solutions to these common complaints by considering not only what we eat but how we consume our meals. For example, how many times have you seen someone munching on a sandwich while driving through traffic? How many times have we caught a bite to eat at your workstation because we could not take the time to have a proper lunch? Our bodies need an uplifting and settled environment in order to process and absorb the nutrients from our meals. If that is not available then we should at least be sitting down to eat - not standing, walking, or driving our way through a meal. The act of eating is life-giving. The process of eating, according to ayurveda, is something reverent and important for the development of consciousness as well as our physical health. When we sit down to eat our stomach is in a relaxed posture and our awareness is on the taste, texture, and smell of the food. This will greatly improve the digestion. Another way to improve the digestion is to stimulate the agni or digestive fire before we begin eating. Weak digestive agni may result in fatigue after eating so Ayurveda recommends eating a 1-inch piece of fresh ginger with a few drops of lemon juice and a few pinches of salt on it before a full meal. This starts to activate the salivary glands, producing the necessary enzymes so that the nutrients in the food are easily absorbed by the body. Balancing your digestive agni is a key principle in Ayurvedic medicine. That's why ayurveda recommends a number of general practices for better digestion. Digestive agni can be compared to a burning fire. If the flame is very low than it will take a long time to cook the food. In the same way if the fire is too big it can burn the food. If we put a huge log on a low fire it will extinguish it. Our digestive fires should be balanced so that we can digest our meals efficiently and smoothly. 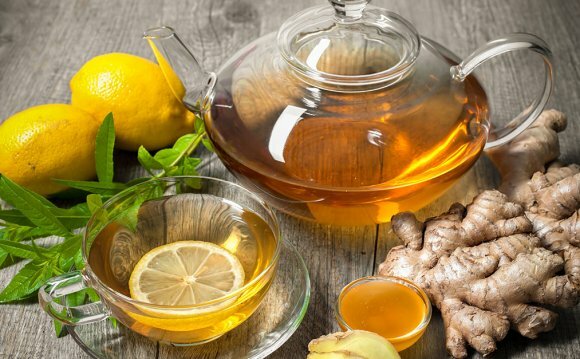 The ginger and lemon juice recommendation helps to increase the digestive power. If, however you suffer from an over-active agni, because of which there is too much internal heat and acid, then pomegranate chutney may be more suitable for you. The next ayurvedic recommendation also addresses agni. Ayurveda recommends avoiding cold drinks at meals and ice cold foods in general. This is like putting cold water on the burning logs. Iced water, normally served at restaurants, extinguishes the digestive fire. Even juice or milk right out of the refrigerator is too cold for the digestion. Juice should be taken at room temperature and water without ice. Once you get into this habit of drinking beverages at room temperature you will notice a dramatic improvement in your digestion and the way your body feels while eating and after the meal. Cold drinks and foods mixed with warm cooked foods can cause stomach cramps, bloating and general discomfort in the stomach area. If you have a Pitta imbalance you can take cool drinks in-between meals. Cold or frozen foods are not recommended for Pitta either because even though they may temporarily cool down the heat, the agni is still being over stimulated and the imbalance will continue. Try slightly cool drinks made with Organic Rose Water, or milk blended with dates or fresh mangos. The next recommendation has to with the time of the day that you eat your meals. Have you ever gone out for a late dinner and found that it was a strain to wake up the next morning or that it was difficult to be efficient during the following day? These are often the side effects of improperly digested food. The best way to avoid these problems is to follow nature's prescription of suitable times to eat. When the sun is strongest between 12 and 2 p.m. is when the digestive fire is also strongest. Agni is associated with the Sun. This is one of the ways ayurveda seeks to connect our mind and body with the environment. Ayurveda recommends that lunch be the largest meal of the day since that is the time the digestive agni is working at its maximum potency. As the sun goes down so does our agni. Dinner should be lighter than lunch and should ideally be eaten before 8: 00 p.m. Late night meals interfere with sleep and after 10: 00 p.m. the body is working to burn off toxins and continue to digest food from the day. If you eat after 10: 00 p.m., the food may cause toxins to accumulate in the system, and as a result the next day you wake up tired. If you are not able to wake up fresh and clear, then it is important to analyze the quantity of food and the time of night you are eating dinner. Another ayurvedic tip for digestion is to drink a fresh yogurt drink called Lassi at lunch time. Sweet lassi consists of 1/4 cup fresh homemade yogurt, 1 cup room temperature water and sugar to taste. Blend it for one minute in the blender. Lassi is light and contains lactobacilli, necessary bacteria that lubricate the intestines to help digestion go smoothly. Lassi drinks help to reduce gas and bloating. They also taste delicious and can make a meal more satisfying and nutritious. Blend for one minute. Drink after lunch. Eat sitting down, in a settled environment, without the TV on. Eat a fresh piece of ginger and lemon before a full meal or (pomegranate chutney to balance Pitta). Avoid ice cold drinks and food. Lunch should be the biggest meal of the day. Dinner should be lighter and eaten before 8: 00 p.m.
Ayurveda & Digestion 10/13. Keeping Doshas Balanced.